« Look at Terry go! All around the table the needles were clicking and the conversations were animated, as always at the Friday morning knitting group, and two FO’s got captured on the camera. Patricia has embarked upon making the most lovely project-style fully-lined bags…they are so stylish and so functional. 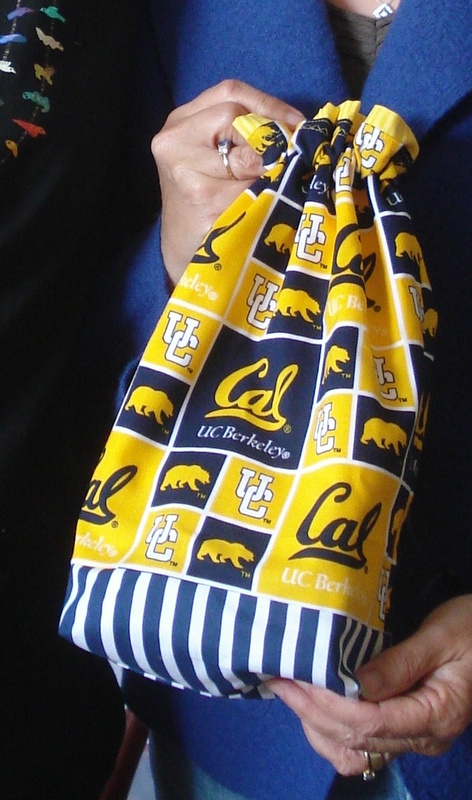 One of her most recent is the bag she made with Cal-motif fabric for our Friday morning Cal Supporter – Jean. I purchased one from her recently…and surprise of surpises…the motif design on mine is dog-related. We can look forward to more of Patricia’s bag designs soon. 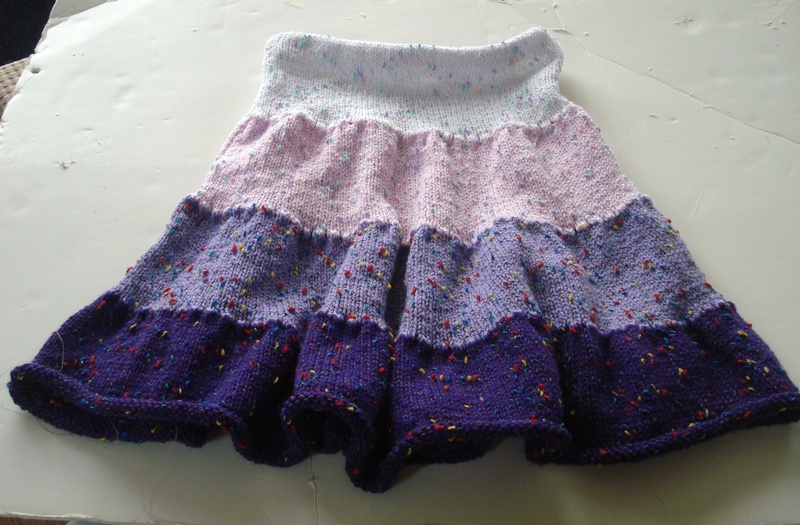 Janie showed the Twirly Skirt that she just finished knitting for her 4-yr old granddaughter. It is so darn cute. The name of the yarn escapes me but it is a “tutti-fruity” kind of style – yarn flecked with color. I am quite taken with the knitted Twirly Skirt as Christmas gifts for my very young nieces. So, I’ve just placed a call to my sister and forwarded the link to her…so I can get the “approval”. She’s always appreciative…but I know the girls are starting to form their opinions – ages 8, 6, & 4 (I think) – and just want to be sure they will think it as cute as I do! 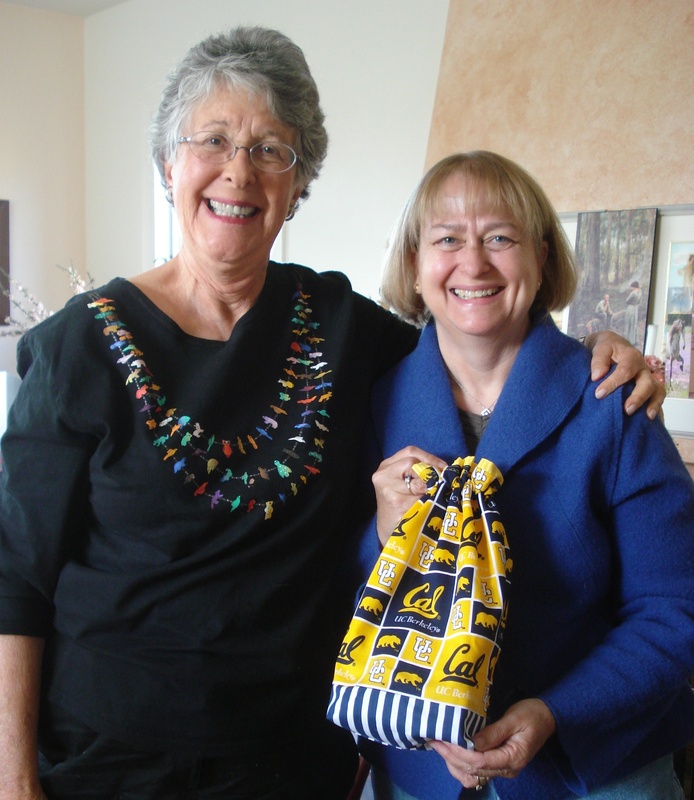 Knitting friend Lyn Kelly shared a great memory that she recalled when she read this post. Hi, what cute skirts. May I also suggest Frog Tree’s Picoboo-pima cotton and bamboo, as well as several of Kollage’s yarns: Milky Whey, Corntastic, Luscious. Also, Be Sweet’s Bamboo is like silk! Joan…thanks for you great suggestions….I will try to catch up with you in the next couple weeks.